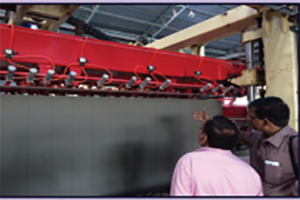 INTRA GROUP manufacture Plant & Machinery To Make Light Weight Aac Blocks all over India. We offer high quality and exactly designed bricks which are manufactured with Autoclaved Aerated Concrete a path-breaking technology in the construction Industry. Plant and Machinery to make light weight AAC blocks is a cost effective and also environment-friendly substitute of red clay bricks as construction materials for making walls. Light Weight AAC Blocks has excellent properties which include excellent thermal and also sound insulation properties along with light-weight yet high load bearing capacity. These AAC blocks require only low cost of construction and energy-efficient manufacturing and installation. Light weight AAC Blocks is a highly thermal insulating concrete-based material which is used for both internal and external construction. one of its advantages about aac block is quick and easy installation. AAC is suitable in the areas of urban with high rise buildings and with high-temperature variations. AAC is used mainly in construction projects across the world and produced from Five basic raw material namely Fly ash, Sand, lime, gypsum, Aluminum powder and water combined with an expanding agent. We offer our clients with wide range of AAC blocks that is Manufactured according to international standards. Our products are manufactured by using high-grade raw materials. Our products are highly demanded in the industry for superior quality.